Produced in partnership with the Association of International Certified Professional Accountants and on the topic of ‘Readying business for the big data revolution’, Russell Goldsmith was joined by the Association’s, Associate Technical Director, Peter Simons and Simon Jeffery, Group Manager for Technology & Management Information Systems at Siem Car Carriers, a company that operates global liner services, specialising in the movement of cars – roll-on roll-off (RO-RO) – and high, heavy project cargoes. They operate two main areas – Pacific (from US West Coast across to China & Asia) and Atlantic (Northern Europe to East Coast US). Peter explained that the topic of big data shows the benefits of the Association and of management accounting. 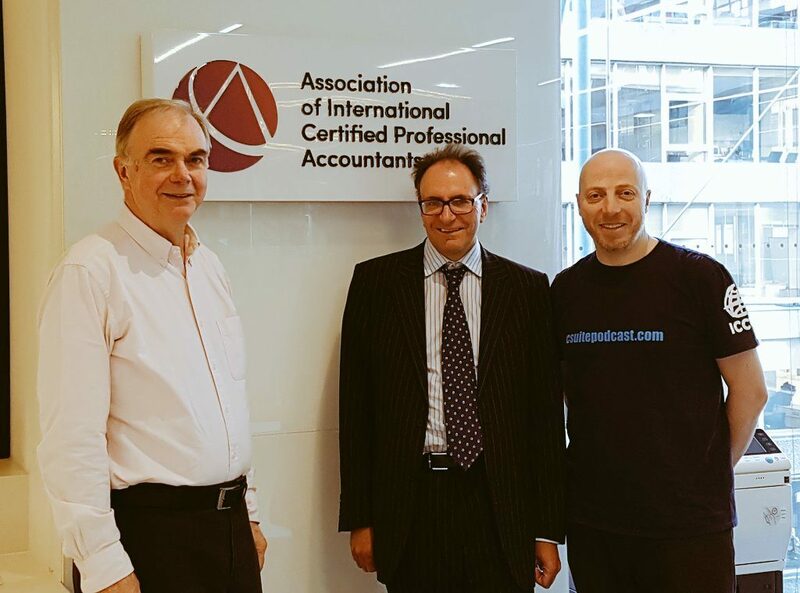 The association brings together the Chartered Institute of Management Accountants (CIMA) and the American Institute of Certified Public Accountants (AICPA) and Peter said that the combination can offer a qualification and lifelong learning support, which is important in this digital age, particularly when new topics come along like Big Data. He added that traditional financial accountants are not interested in Big Data, but it is important for management accountants as they want to provide the information to measure, manage and improve performance. Simon said that shipping is a very complex business and there is a great requirement for good quality management information. Data is a core business asset and it is his job to unlock the potential that data can offer in the way of good decision making. There has been plenty written about how businesses are benefiting from the developments in the use of data for their decision making and performance management, but companies still seem to be struggling to get to grips with it. The CGMA report, produced off the back of a survey carried out a few years ago amongst 2000 finance professionals where 86% of the organisations they work for said they are struggling to get valuable insights from their data. Yet this doesn’t seem to have changed when considering a recent by Forrester Consulting for Velocidi found that nearly one-third of US firms lack experience when it comes to translating their data into insight and action, stating that one of the reasons why marketers are struggling in this area is because 74% of companies have yet to implement a senior role like ‘chief data officer’ or ‘chief analytics officer’. Peter agreed that it has not moved on much, because there are a range of things you need to be good at to get value out of data, including both the Technical and Commercial aspects. He said that this includes being good at data management, but you have to have good data to work with. However, you also have to be able to analyse that data, but as some analysis can be very complex, you also need Data Scientists. He added that you also need to have the culture where it is expected that decisions will be evidence based, where people are always looking at ways to improve performance which is why he feels you need an objective professional ensuring that you have that culture. Finally, you need someone who can turn an analytical insight into a commercial insight and run with it. He therefore feels that a specific role is not necessarily needed, you just need to get on with it and he believes management accountants are well placed to deal with this. Simon explained that Siem Cars Carries have data (financial, technical, operational, marketing, external from customers and suppliers) all over the place and not always in the same format and his job is to bring it together, which can create a powerful information system. To explain how it works, he talked about how they monitor any damages caused to vehicles whilst in Siem’s custody. He said that the previous system used for the claims handling was very cumbersome. He therefore combined four different databases, resulting in a powerful management information system. He took data from the customer system, which was just reporting on the damage, linked it to the data from their surveyors, the cargo booking system, so they could see where the cars were going, plus the finance system. After combining all the data and simply sorting it by cargo claims, patterns started to emerge, for example, showing a certain type of tyre damage on a particular vehicle, which turned out to be a production issue of the customer’s. They ended up rescinding over 90% of outstanding claims because they had the analysis of it. The result is a streamlined process and improved customer relations, adding value to the customer chain. Understanding how to present the data is also just as important as being able to interpret it and CGMA also recently released a thought leadership report with KPMG on this topic titled, Report visualisation: From concept to deployment. Simon believes this is crucial. He said it’s really important to produce a clear one-page summary of the data, which Peter agreed on, saying what is important is how you present the finding and the ‘what to do next’. Peter feels that the management accountants are well positioned to unlock Big Data opportunities, but they need to be a broker of information within the business. He said that whoever owns the process that generates the data presents the findings of that data, so there is a need for someone objective in the business who can provide some validity when that information is presented to the Board. Credible – do the numbers pass the sense check? Peter added a 5th ‘C’ – Commercial – do we make money from this? As for the tools to use, Simon said that you can simply use Excel to create the database, but he believes a big game changer has been Microsoft’s BI tools via Microsoft Azure in the cloud [discussed in Show 56], which he said has been a game changer, are cheap to use (they pay on a monthly basis) and help to query those databases. Using the cloud based systems gives them the instant access to the data. Peter added that there are Excel courses and Power BI resources available at the CGMA Store on the CIMA-Global website and for general information on Big Data and Innovation to use the resources on the CGMA website.